In this article we’ll show you how to create a NHibernate-based application with DHTMLX Scheduler .NET web control in 7 simple steps. You'll learn how to create an event calendar, connect it to the database created in SQL Server Management Studio and customize NHibernate for .NET appropriately. Create a new MVC3 Razor project in Visual Studio 2010/2012 and name it ‘DHXSchedulerNHibernate’. 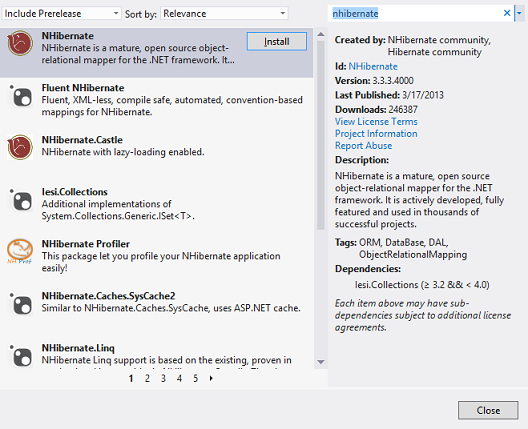 For this app you have to install two packages via NuGet, namely DHTMLX.Scheduler.MVC3.Sample and NHibernate. We use the easiest table structure with only 4 compulsory columns in our sample. That’s why we can use CalendarEvent as a mapping class. 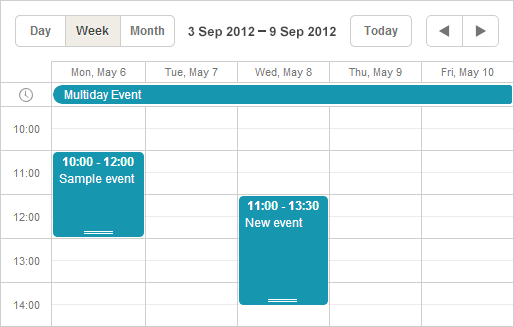 It comes with Scheduler .NET sample. Any extra columns would require corresponding properties to be added manually to the class, or urge the creation of a new class. This part describes the principle of NHibernate work with the database. We'll have to open a database session, create and execute a transaction, and dispose the session. NHibernate sessions are created with SessionFactory. As far as the initialization of SessionFactory is relatively costly, it’s important to ensure that initialization happens only once per application. We’ll create a simple Singleton class that will create a SessionFactory in a static initializer (that is guaranteed to run only once per application domain) and will have a static accessor for the session instance. Proceed with the tutorial and you'll get the explanation on the applied configuration parameters. The presence of only one model class can complicate the demo, but if you build a more practical app, think of the following solution. To map the model to the database, we’ll use XML files. You can also achieve that with tools like Fluent NHibernate or with class attributes. You can write configuration data to separate files, place them in the embedded resources or add them to the app.config file. We’ll use embedded resources. Note: after you deploy the application, double check there’s no publicly available xml mapping files. Note: To let NHibernate get the correct file from the assembly, change the build action in for each map file to the ‘Embedded Resource’. Specify the connection string in the property named ‘connection.connection_string’. SQL dialect must be specified in the “dialect” parameter. It shouldn’t be necessarily mssql2005, MsSql2008Dialect or MsSql2012Dialect would work as well, however mssql2005 will be enough for most of the things we do. Of course, this is a very basic demo and it doesn’t really display the advantages offered by NHibernate, and still it can be useful by those who are new to NHibernate or DHTMLX Scheduler for .NET. IMPORTANT: This is not a complete demo. You still need to create a database and change the connection string. Feel free to comment and share this post with your friends.